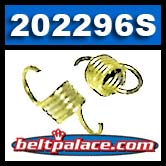 Comet 202296S, (QTY 2) YELLOW SPRINGS FOR HOFFO-COMET 350 SERIES CLUTCH. ALSO USED BY INDUSTRIAL DEEP ROCK WELL DRILL CLUTCHES. Comet 200113A Green Clutch Springs. Package of 2. �Green� springs for 350 Series Clutch. 1300/1500 engagement. Comet 200113-A. Comet 200114A Red Clutch Springs. Package of 2. Standard �Red� springs for 350 Series Clutch. 1800/2000 engagement. Comet 200114A Red Clutch Springs. Package of 2. Standard �Red� springs for 350 Series Clutch. 1800/2000 engagement. Comet 200114-A. Comet 200115A Brown Clutch Springs. Package of 2. Standard �Brown� springs for 350 Series Clutch. 2200/2400 engagement. Comet 200115A Brown Clutch Springs. Package of 2. Standard �Brown� springs for 350 Series Clutch. 2200/2400 engagement. Comet 200115-A.